If I'm AirPlaying my screen, I likely don't want the room to see my notifications. Is there a way to automatically kill notifs when I connect besides manually option+clicking the icon in the upper-right corner each time? 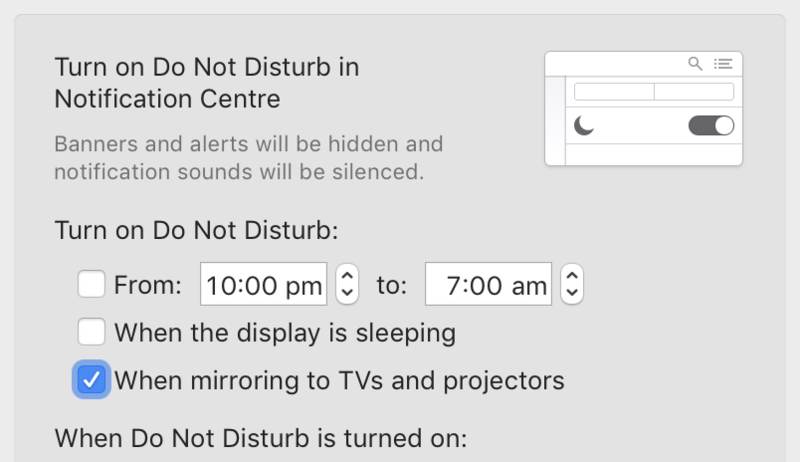 Open System Preferences → Notifications, select Do Not Disturb in the sidebar and enable ‘Turn on Do Not Disturb: When mirroring to TVs and projectors’. If you enable AirPlay without mirroring, then Do Not Disturb is not activated, but the notifications only appear on your primary monitor anyway. Not the answer you're looking for? Browse other questions tagged notifications airplay . Is there a way to change which shares are shown on the bottom of the iOS 5 notifications screen? Is it possible to automatically turn vibrate mode off at night? Can I turn off all notifications? Is there a way to Reindex/“Reinstall” AirPlay Devices in OS X?